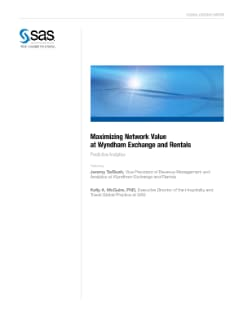 As a worldwide leader in vacation exchange, RCI Group – a division of Wyndham Exchange and Rentals – faces complex business issues, including inventory that can be highly variable and potential demand that is constrained. The company uses predictive analytics to improve the value of its network, make more effective revenue management decisions in less time, and deliver a better customer experience. RCI Group talked about how advanced analytics have helped improve the efficiency of matching up demand and supply – which has had tangible effects on the value of their network and its transactions – in a webinar in the SAS Applying Business Analytics Series. This paper presents insights from that webinar.